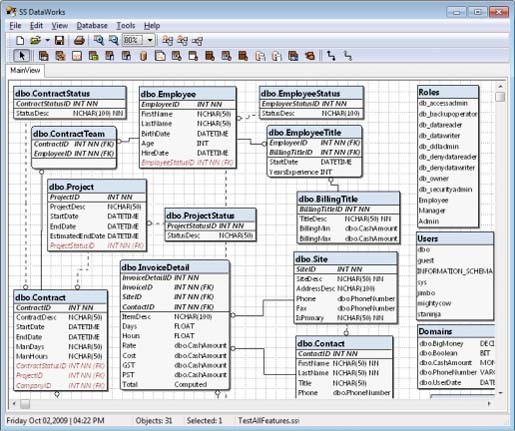 SSDataWorks is a tool that quickly lets you edit or create the new database entity relationship models. The tool has been especially designed for Microsoft SQL Server 2005. If you use this tool, you’ll be empowered when modelling an SQL Server 2005 database features are not generic. Using the SSDataWorks, you can model user defined types, tables, indexes, procedures, roles, triggers, views, schemas and XML schemas. Moreover, using this tool, you can create and edit every part of the SQL Server database with SSDataWorks in our user friendly graphical interface. The other features are that the tool reduces the amount of time needed to create or maintain your databases. Features such as forward and reverse engineering a database and saving and loading your work and preferences makes SSDataWorks a powerful tool for creating new databases or maintaining existing ones. Check out the following key features of SSDataWorks. This tool is capable of generating T-SQL DDL scripts for creating our database to a live server. It is able to reverse the engineer existing database from a live server or T-SQL scripts and automatically layout your entitiy-relationship diagrams. You can apply the changes made to the data model directly to an existing database or you can generate the T-SQL Scripts. If you wish, you can merge the changes from the existing live databases into your database entity relationship diagrams. It uses entity-relationship diagrams to graphically layout your data model with various levels of detail. With this tool, you can get an easier way to use the visual interface that lets you design our database with the minimal or no knowledge of SQL syntax. • SSDataWorks has a easy intuitive interface that's let you focus immediately on building your data-model with a minimal learning curve. • Generate detailed reports in HTML to document your database models.